Works with most appliances that utilize a Mini USB connector. Cable mounted weatherproof in-line regulator assures the voltage is properly stepped down to 5V. Available with Powerlet® Low Profile Plug and a 36" coil cable. Works great with Garmin GPS! 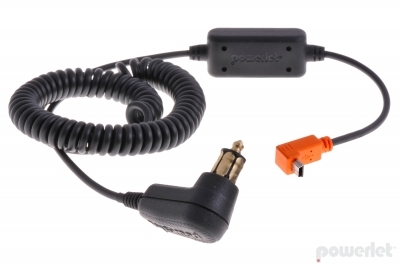 Powerlet's line of mini-USB power cables are tough, dependable and built for powersport activity. Glove-friendly design insures ease of connection and use. Small size enables easy storage. Works with stock sockets found on BMW, Ducati, Aprilia, Triumph, Moto Guzzi and Victory motorcycles. Offered in a variety of lengths including a direct to battery harness. Dash SC = Short cable - a 12" long version complete with a Powerlet straight plug. Dash (none) = Standard cable - 36" coiled lead length complete with a Powerlet low profile plug.